Sagittarius, Scorpius, and the Summer Milky Way. 궁수자리, 전갈자리, 그리고 여름철 은하수. 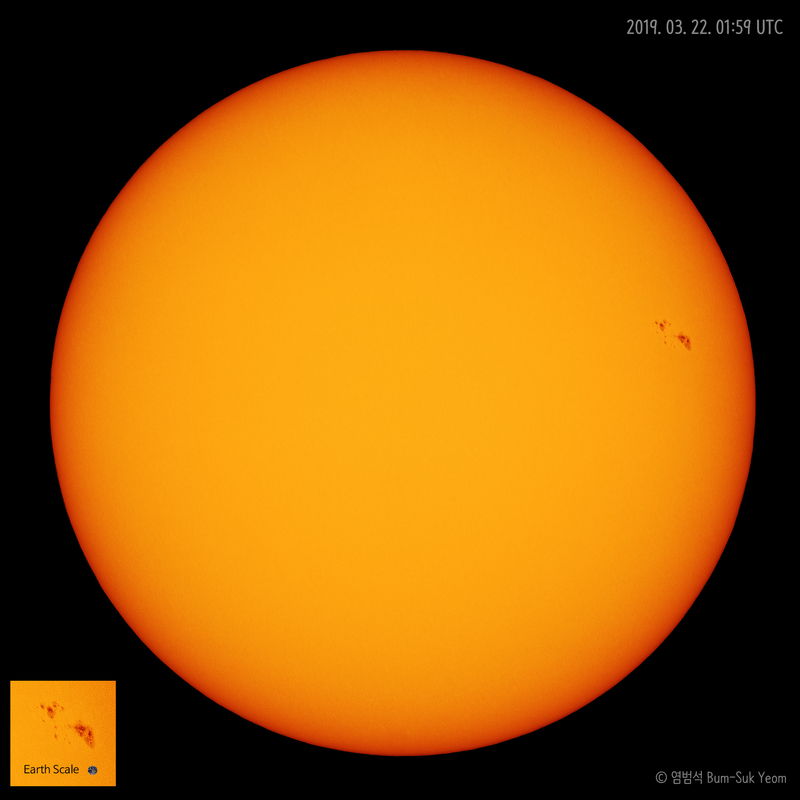 Taken by Bum-Suk Yeom (www.cometsky.com) on April 14, 2019 UTC @ Jangsu, South Korea. Details: 18:43 UTC (03:43 April 15 KST) Sigma Art 35mm F1.4 lens with EOS 5D Mark III camera, SkyTracker mount, Geratin filter (Lee soft #2 filter), ISO 3200, f/4, 30 sec. 2019. 04. 15. 03:43 KST, 시그마 아트 35mm F1.4 렌즈, 캐논 EOS 5D Mark III 카메라, 스카이트래커 휴대용 적도의, f/4, ISO 3200, 리 소프트 2번 필터, 노출시간 30초, 전라북도 장수, 염범석 Bum-Suk Yeom. 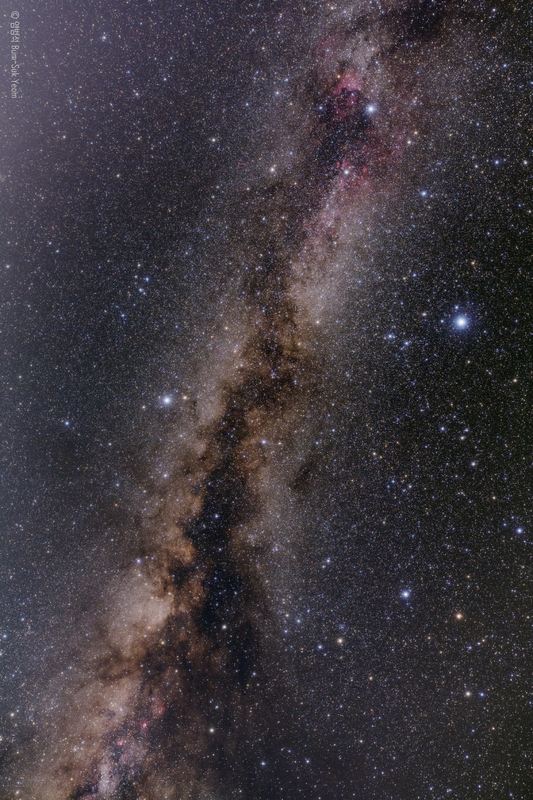 Summer Triangle and the Milky Way. 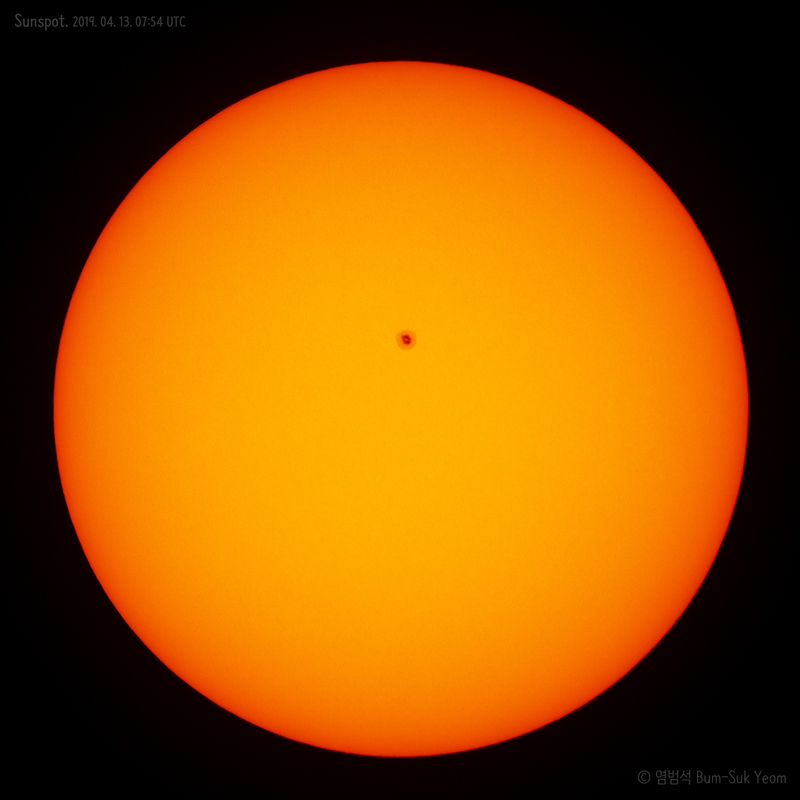 Taken by Bum-Suk Yeom (www.cometsky.com) on April 14, 2019 UTC @ Jangsu, South Korea. Details: 19:27 UTC (04:27 April 15 KST) Sigma Art 14-24mm F2.8 zoom lens (at 21mm) with EOS 5D Mark III camera, SkyTracker mount, Geratin filter (Lee soft #2 filter), ISO 800, f/4.5, 300 sec x 4 = 20 min. 2019. 04. 15. 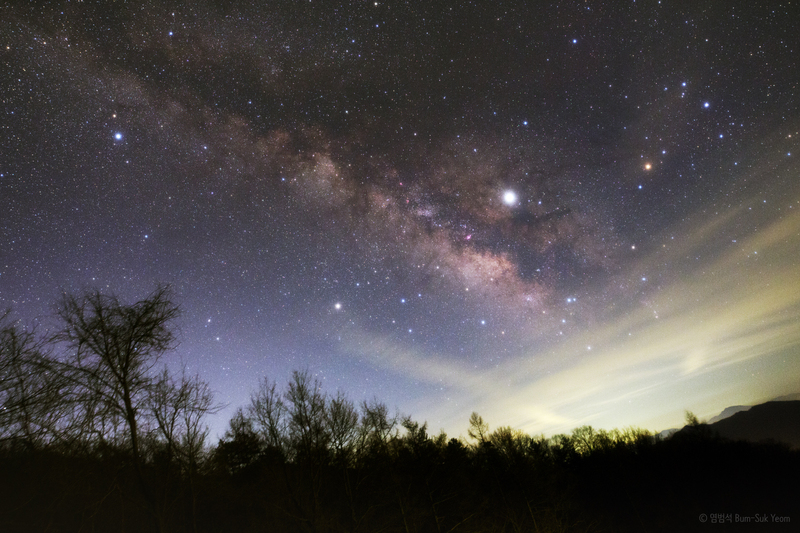 04:27 KST, 시그마 아트 14-24mm F2.8 줌 렌즈 (21mm 설정), 캐논 EOS 5D Mark III 카메라, 스카이트래커 휴대용 적도의, f/4.5, ISO 800, 리 소프트 2번 필터, 노출시간 300초 x 4 = 20분, 전라북도 장수, 염범석 Bum-Suk Yeom. 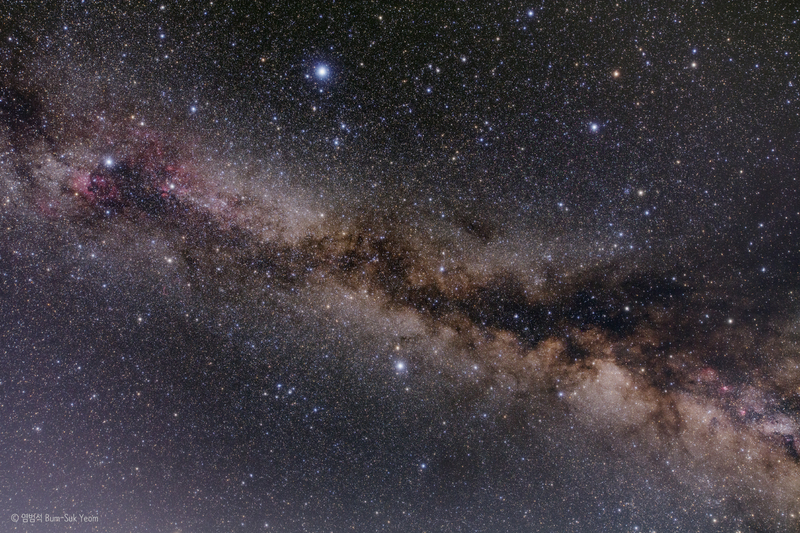 The Summer Triangle is an astronomical asterism involving an imaginary triangle drawn on the northern hemisphere's celestial sphere, with its defining vertices at Altair, Deneb, and Vega, the brightest stars in the three constellations of Aquila, Cygnus, and Lyra, respectively. 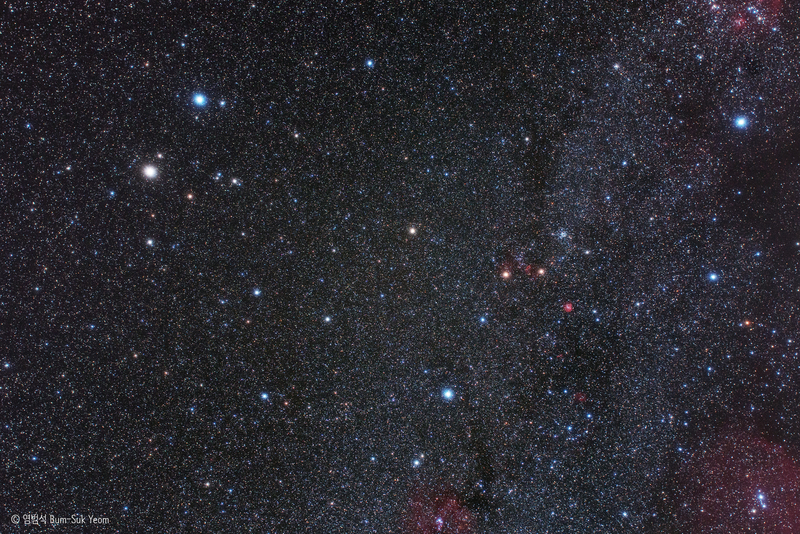 Altair shines below center, while fainter Deneb is found at upper left and the brightest star of the Summer Triangle, Vega, at upper center. 여름철 대삼각형은 거문고자리의 베가(직녀), 백조자리의 데네브, 그리고 독수리자리의 알타이르(견우)가 이루는 삼각형을 말합니다. 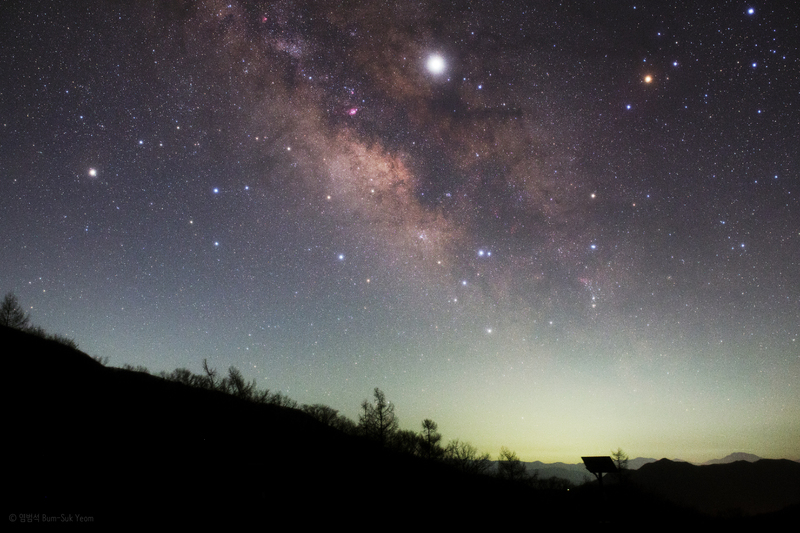 데네브(Deneb)는 사진의 왼쪽 위에 있고, 여름철 대삼각형의 가장 밝은 별인 베가(Vega, 직녀)는 중앙의 위쪽에 있으며, 알타이르(Altair, 견우)는 중앙 아래에서 볼 수 있습니다. Jupiter, Saturn, and the Milky Way. 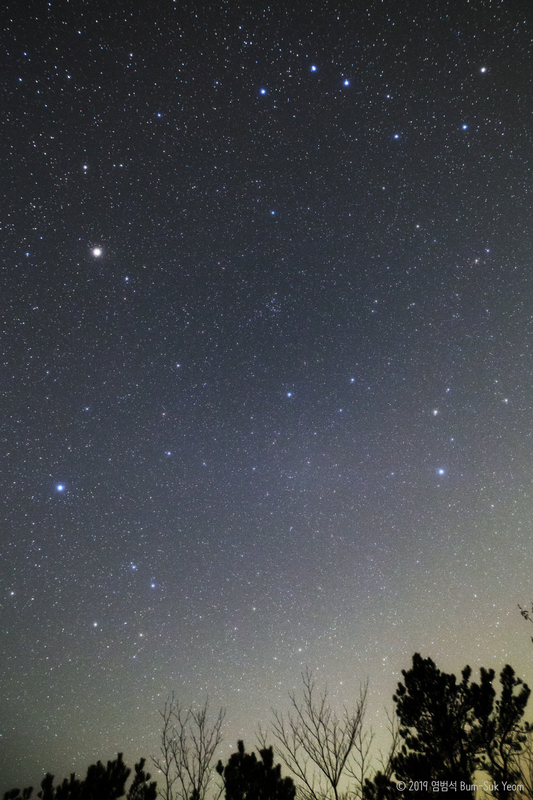 Taken by Bum-Suk Yeom (www.cometsky.com) on April 7, 2019 UTC @ Jangsu, South Korea. Details: 19:51 UTC (04:51 April 8 KST) Sigma Art 14-24mm F2.8 zoom lens (at 20mm) with EOS 5D Mark III camera, SkyTracker mount, Geratin filter (Lee soft #2 filter), ISO 3200, f/4, 40 sec. 2019. 04. 08. 04:51 KST, 시그마 아트 14-24mm F2.8 줌 렌즈, 캐논 EOS 5D Mark III 카메라, 스카이트래커 휴대용 적도의, f/4, ISO 3200, 리 소프트 2번 필터, 노출시간 40초, 전라북도 장수, 염범석 Bum-Suk Yeom.